Maui Bliss Villa – Your Pristine Tropical Oasis In Kihei, Maui! 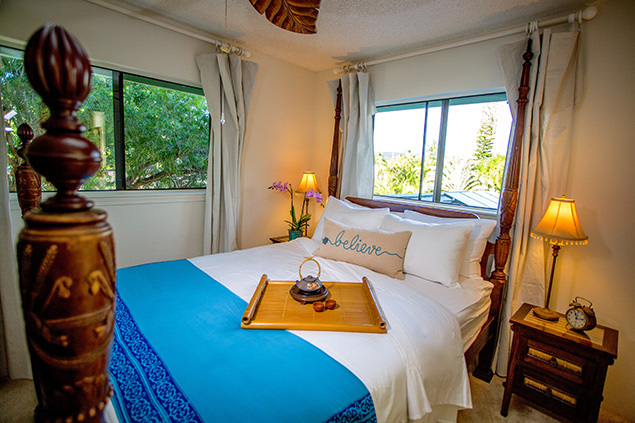 Step into your own tropical oasis at this alluringly peaceful home in the heart of Kihei, a popular beach town in sunny South Maui. This lovingly-maintained, exceptionally sophisticated home is full of life and character that will both inspire and relax you. Hand-picked island-inspired antique furniture from around the world are constants of this home’s serene decor, giving each space its unique atmosphere while unifying the entire villa with relaxing vibes. The home has been designed to take full advantage of tropical airflow by adding wide windows throughout, which fill the home with light and allow for a constant island breeze. Beyond the main entrance and hallway, your living space boasts a family gathering room complete with an elegant, antique dining table with seating for six. Indulge your inner chef and prepare memorable feasts for your guests in your upgraded, gourmet kitchen located directly by the dining room. 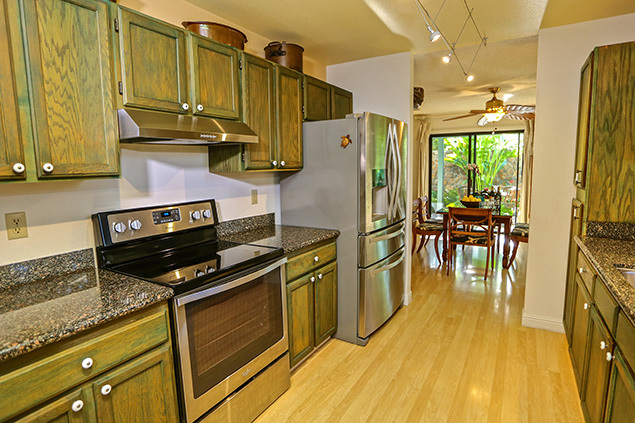 Your fully equipped kitchen comes complete with granite countertops and state-of-the-art stainless steel appliances, ample cabinet space, cookware and all kitchen ware — which all make preparing meals on vacation a pleasure. If you enjoy turning your fresh veggies and fruits into delicious smoothies and juices, you will be delighted to find your very own Vitamix juicer in the cupboards. Top off any meal with fresh passion fruit, tangerines, or the best mangoes from the garden, when in season. Stroll through the tropical garden or relax in a lounge chair while listening to the calming sound of the fountain and melt your stresses away. The garden’s calming meditation area in the back is a great place to clear your mind. 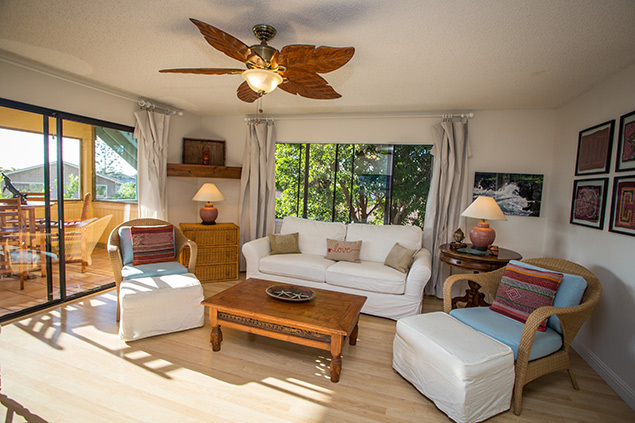 At Maui Bliss Villa, we envision to make as small a foot print as we can on the environment, therefore we ask our guess to enjoy yourselves and use everything you need, and once you are done with it, please turn it off. Mahalo! 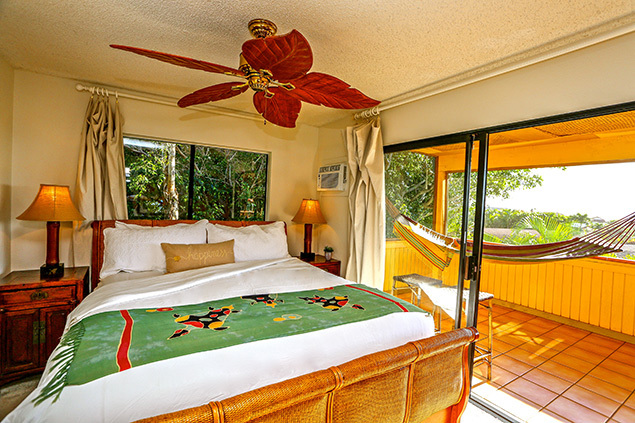 Located on the second story, the master suite offers a comfortable California king bed along with an en-suite bathroom and a spacious closet, plus it opens directly onto a private terrace boasting ocean views. The terrace offers a seating area complete with a bar top table, perfect for an evening game of cards. 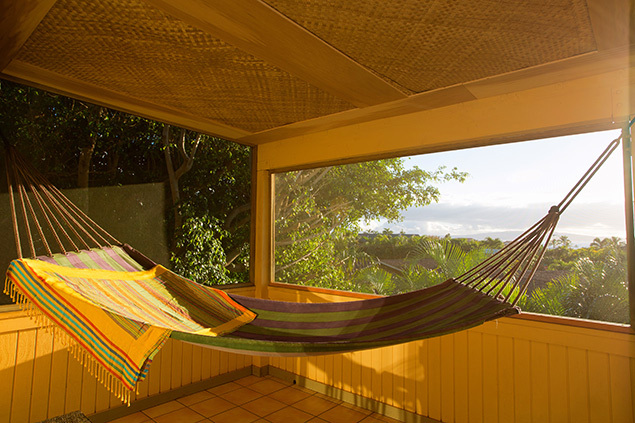 Or just stretch out with your favorite book and gently swing in your hammock on this enclosed, tiled lanai. Two beautifully furnished guest bedrooms follow the master offering queen beds, beach themed decor and shared access to a hall bathroom. Kick back and lounge on the comfy sleeper sofa in the living room located just off the master bedroom. The living room features upscale beach decor and plenty of comfortable seating. Enjoy games on the PlayStation, family time or your favorite show on your big screen TV. Just when you feel like there is no more to be discovered, you will find a staircase leading from your living room’s lanai to the next floor up to your rooftop sundeck. 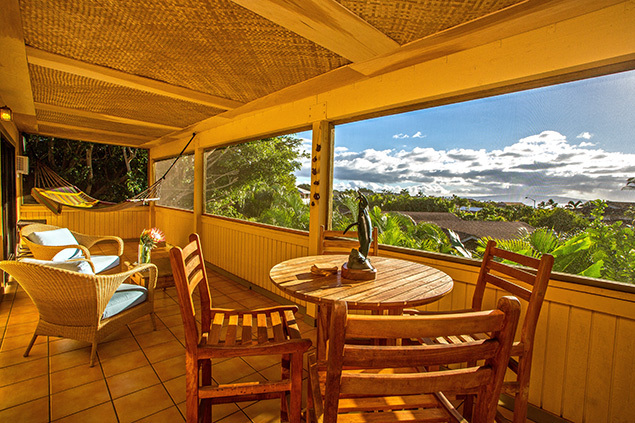 This expansive private deck boasts fantastic, 360 degree’ views of the azure ocean, from Molokini crater, Kahoolawe and Lana’i towards the West Maui Mountains and Maalaea Harbor. When you turn around, you will enjoy endless views of Upcountry and Haleakala (“House of the Sun”), one of Maui’s top attractions. Truly magnificent –always bring your camera! You can start your day by sipping your fresh cup of Maui coffee gazing over glowing pink-purple clouds and the rising sun above Haleakala. Entertain your guests on the roof deck with a tropical mango smoothie from the garden (when in season), while never letting the Pacific out of your sight. The deck also provides you with prime seating to a whale show in season (from November to April). 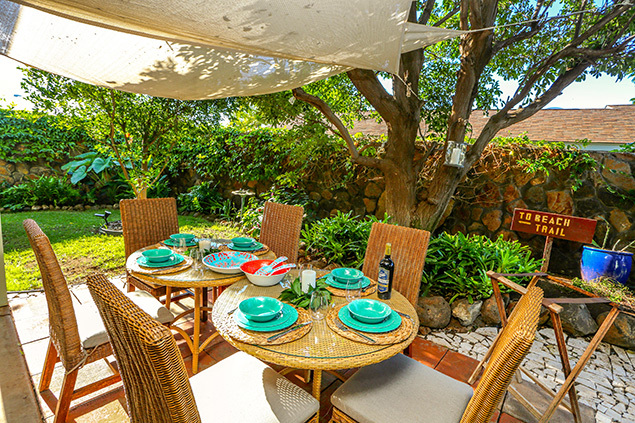 The Ohana has a separate entry and a private, grassy lawn complete with a hammock in a ficus tree, a Weber BBQ grill, a beautiful, mature mango tree and a secondary gated driveway. For a feeling of inclusiveness with the group, the gate between the back yard lanais could be opened for easy access between the ohana and the main house. 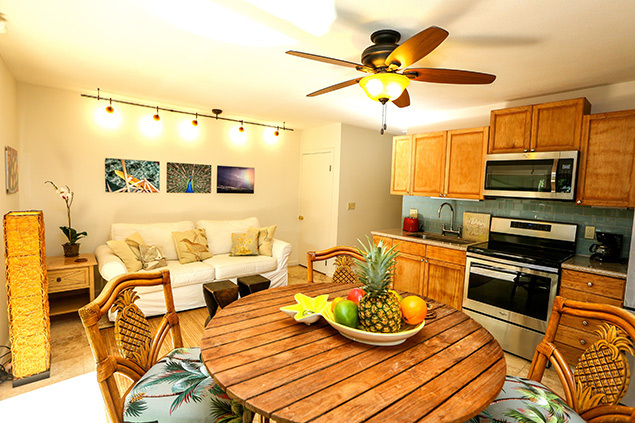 Beach chairs, umbrellas, snorkeling gear, and a boogie board are provided for guests and can be found in the trunk on the covered lanai. Additional guest amenities include complimentary hi-speed wifi, Netflix and Hulu, binoculars for whale watching, an in-unit, commercial washer/dryer, and parking for 4 vehicles. 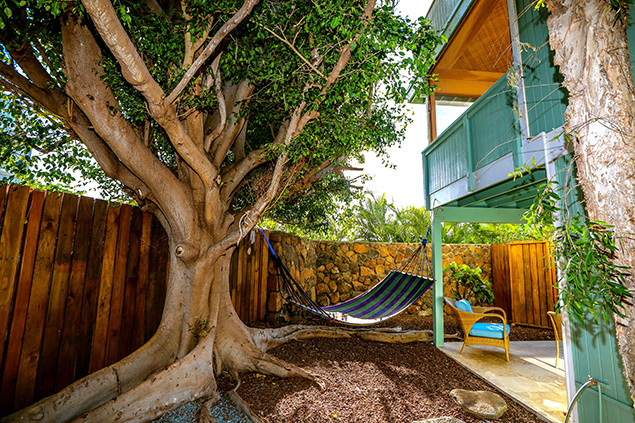 Maui Bliss Villa is situated in a super safe and friendly family neighborhood. Here you can relax and live with everything open and truly enjoy the tropical pure air, while at the same time keeping your privacy. The best beaches of Maui, once frequented by Hawaiian royalty, are just minutes away! Located on the border of Kihei and Wailea Resort town, this villa is within walking distance (10 minutes) or a short driving distance to gorgeous golden sand swimming beaches, award winning restaurants, the Kihei Boat ramp, golf courses and the upscale amenities of Wailea town. Try new cuisines, schedule a spa treatment or explore the shops and galleries of Wailea. Just far enough from the hustle and bustle of Kihei Town, this home is still minutes away from shops, grocery stores and amazing restaurants by car. Get the peace and quiet without compromising convenience. We just know you’ll thoroughly enjoy your tropical home away from home in this private retreat!